One minute poised in midair, apparently motionless before a flower while draining the nectar from its deep cup—though the humming of its wings tells that it is suspended there by no magic—the next instant it has flashed out of sight as if a fairy’s wand had made it suddenly invisible. 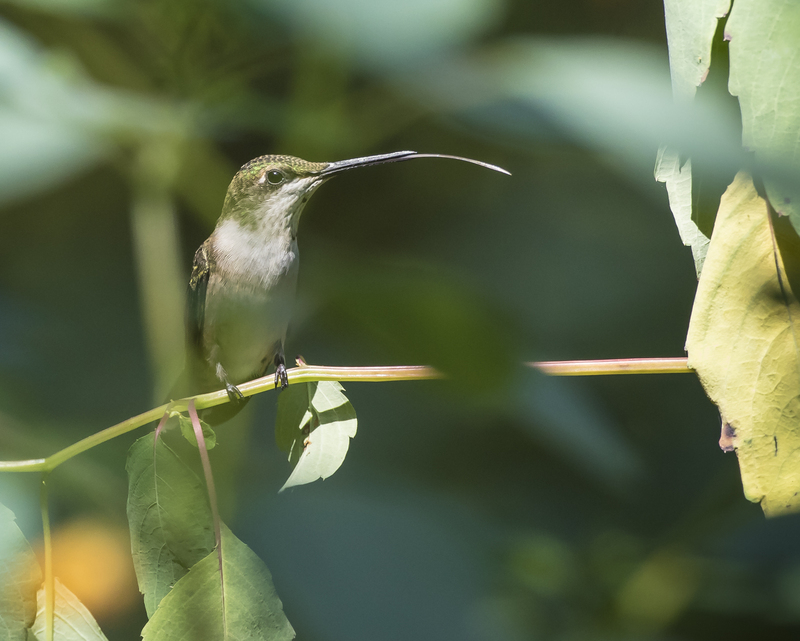 It seems the hummingbirds have been zipping about the yard with added intensity these past couple of weeks. Maybe they are like me and it is the heat that is making them grumpy. Or maybe they know the season is about to change, and that they will soon need to move on, so they had better stock up for the long flight. 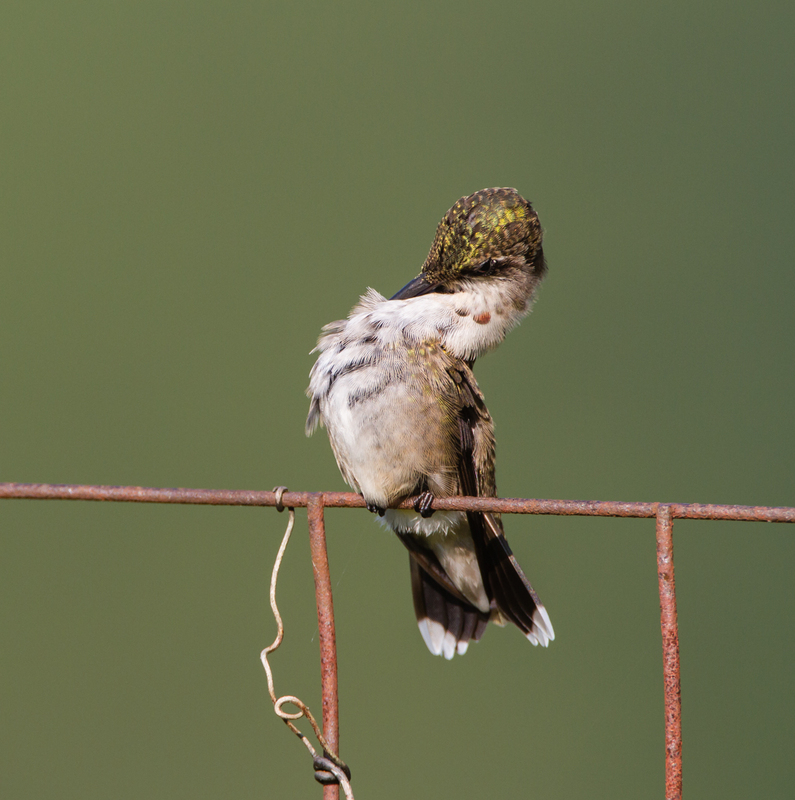 Whatever the reason, it has been quite a show at the feeders and flowers scattered around the yard. I typically see 4 or 5 of the tiny jet fighters at once, meaning there are probably 4 or 5 times that many around the yard. Our place is so shaded that it is hard to find a good sunny spot to photograph them other than in the morning, when the sun highlights the pathway to one of the feeders on the front porch. The past few days have found me standing out in the yard, watching their comings and goings, and trying to capture a few moments of their hectic lives. 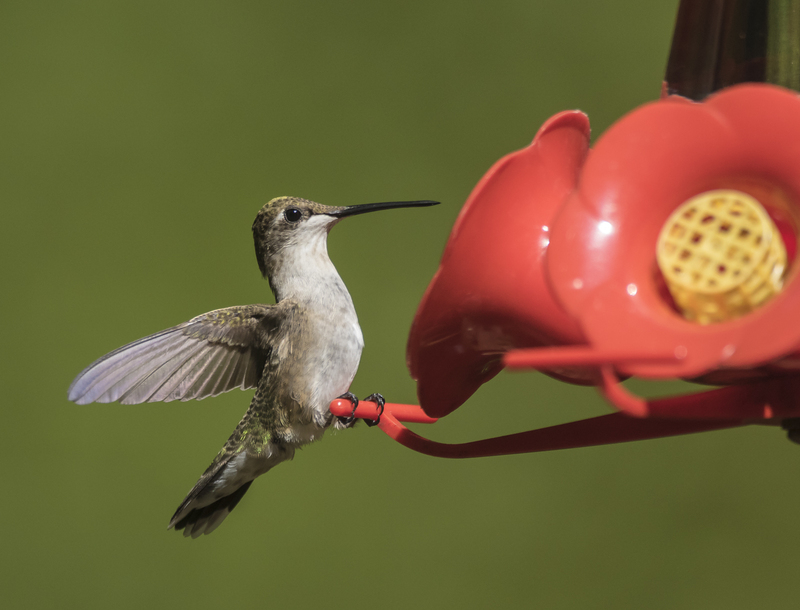 Hummingbirds tend to perch near their favorite feeders/flowers, guarding them against interlopers that might get some of “their” nectar. One bird likes a particular dead branch hanging out over the front walkway. 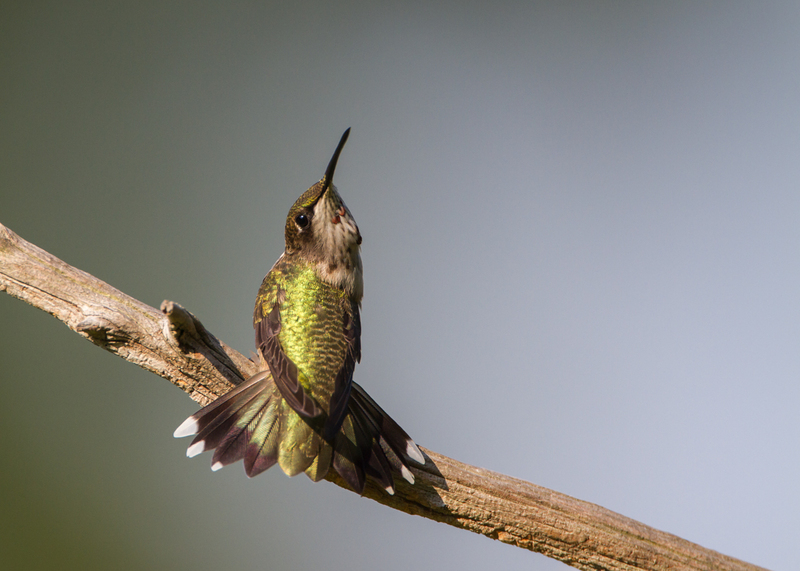 While things at the feeder can be frenetic, I spent a lot of time standing and waiting. 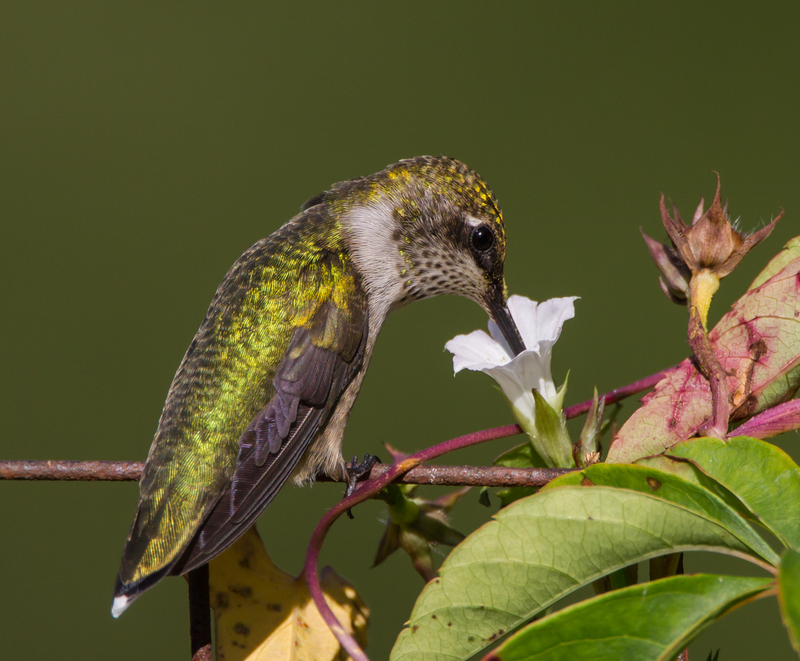 Studies have shown that hummingbirds feed, on average, 5-8 times per hour, but only for 30 – 60 seconds at each feeding. But when they do move in, they do it with gusto. There is nothing subtle about their flight. 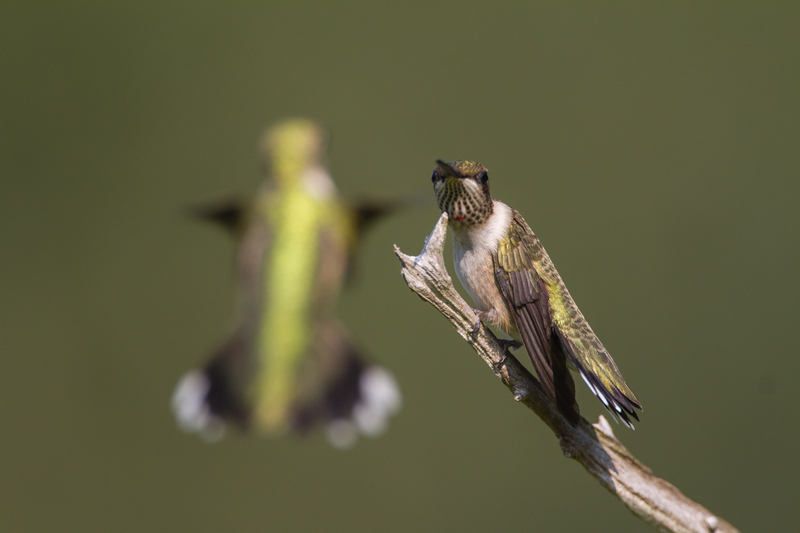 They are pure aerial acrobats, and a joy to watch. 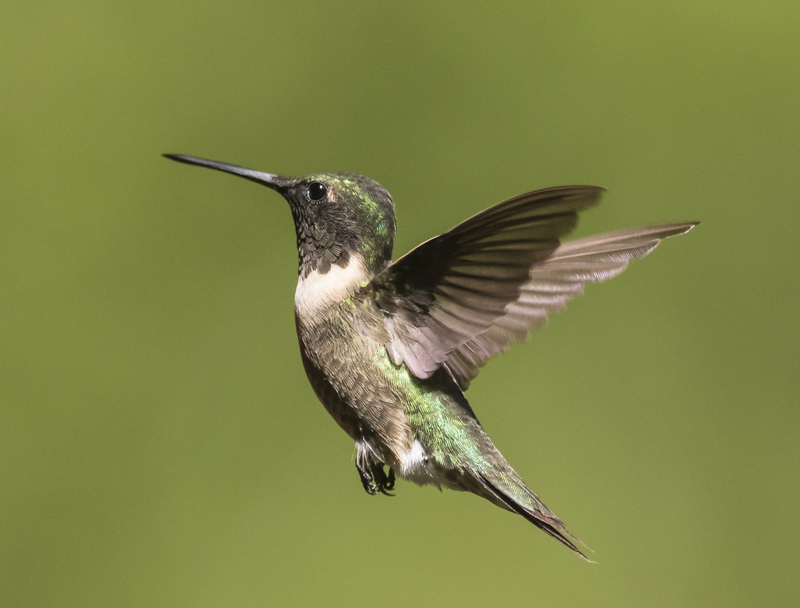 Here are some incredible facts about hummingbirds from two sources: The Hummingbird Book, by Donald and Lillian Stokes; and Operation RubyThroat: The Hummingbird Project. 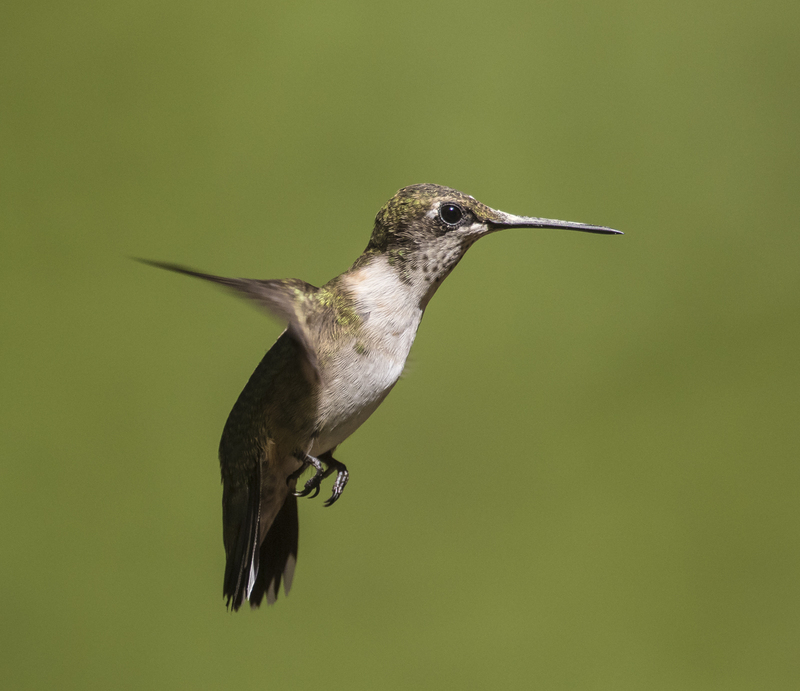 Hummingbirds have the amazing ability to fly forward at speeds up to 50 miles per hour, can hover, fly backward, and even upside down briefly. 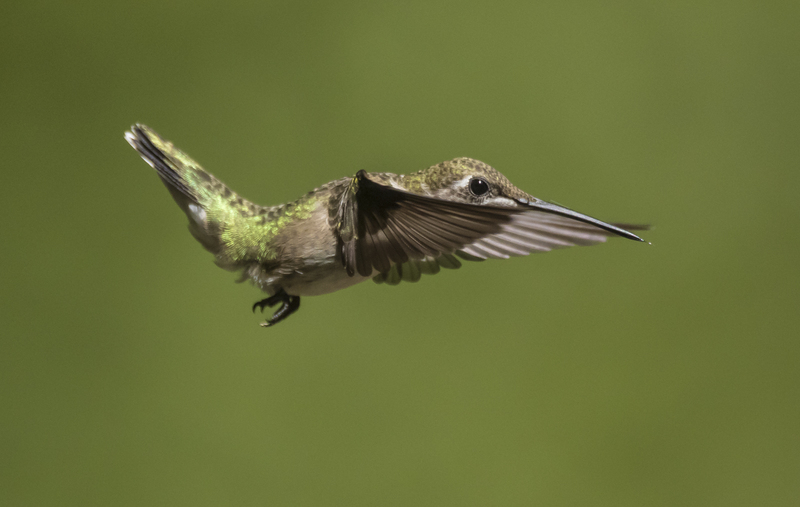 The number of wing beats is also impressive – 60 times per second in normal flight; up to 200 times per second in courtship flight dives. 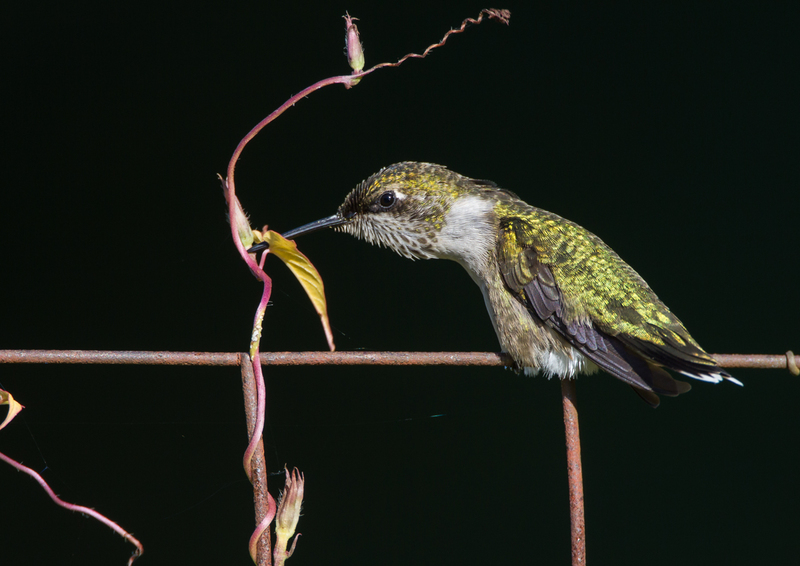 Their unusual wing structure allows hummingbirds to hover better than most other species. 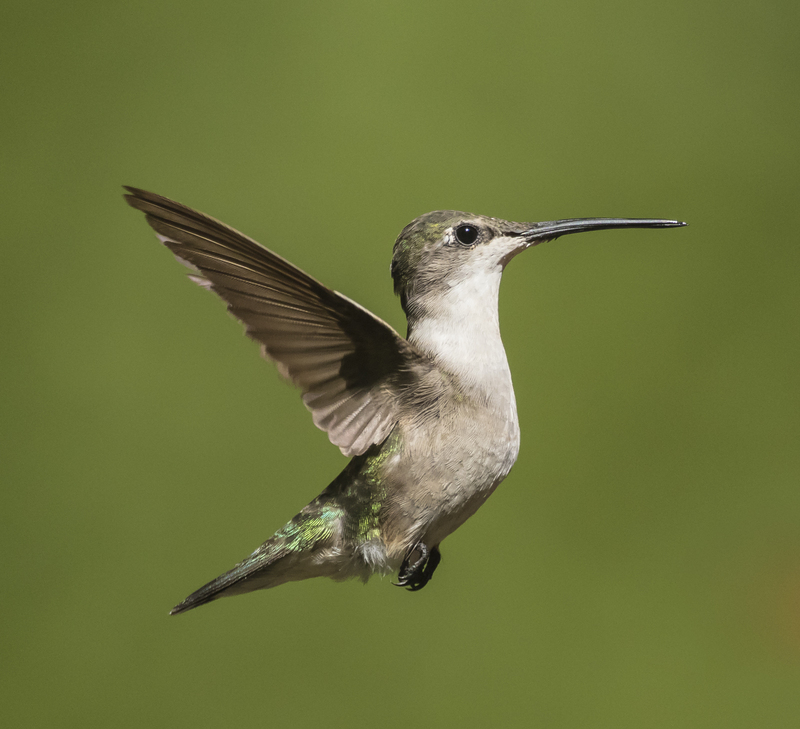 Unlike other birds, the bones in the wing of a hummingbird are fixed, except at the shoulder joint, which can move in all directions. 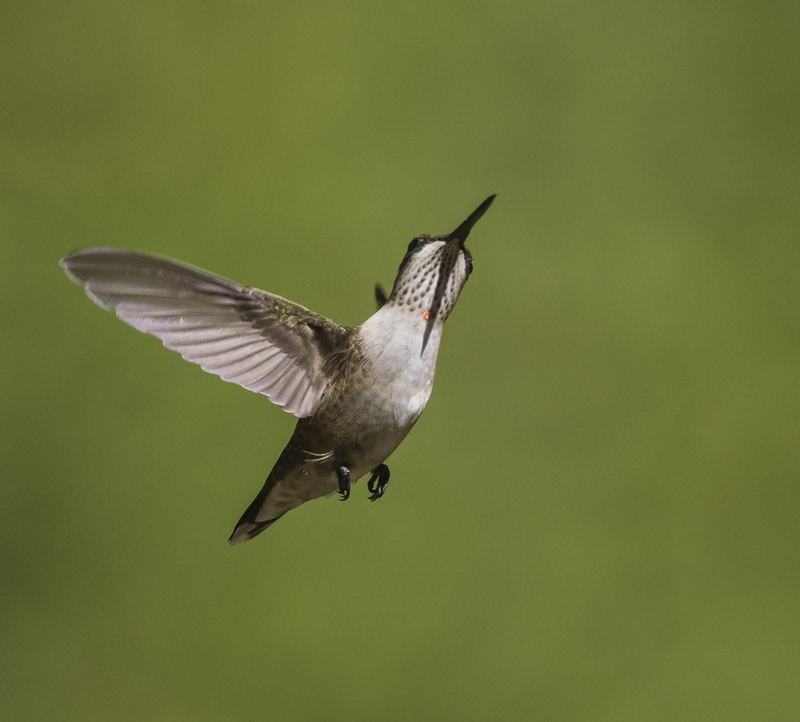 While hovering, a hummingbird’s wing moves forward and then the leading edge rotates almost 180 degrees, and moves back. As this motion is repeated, the tips of the wings trace a horizontal figure eight in the air. 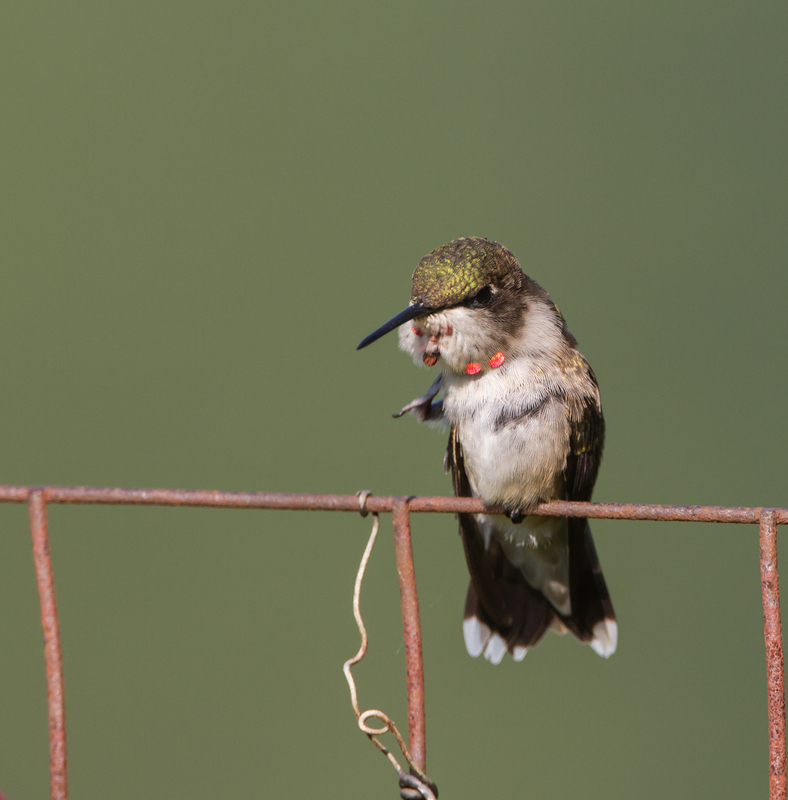 Female ruby-throats are often more aggressive at feeders than males, since they are usually slightly larger. The average male weighs about 3 grams, or about the same as a penny. The average female is slightly larger, weighing in at about 3.5 grams. But both sexes can put on considerable weight this time of year in preparation for the migration south (often almost doubling their mass prior to flying south). 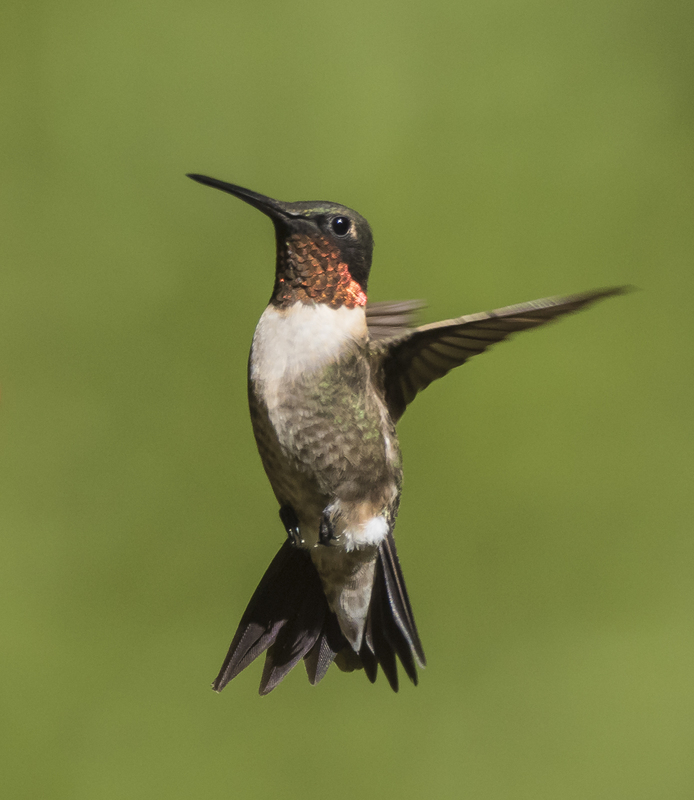 Male ruby-throated hummingbirds are the first to arrive on the breeding grounds in spring, and the first to leave to return to their winter homes in late summer. Many of the adult males have already headed south, so, at first glance, it may look like a bunch of females in your yard. But, a closer look may give you some insights. 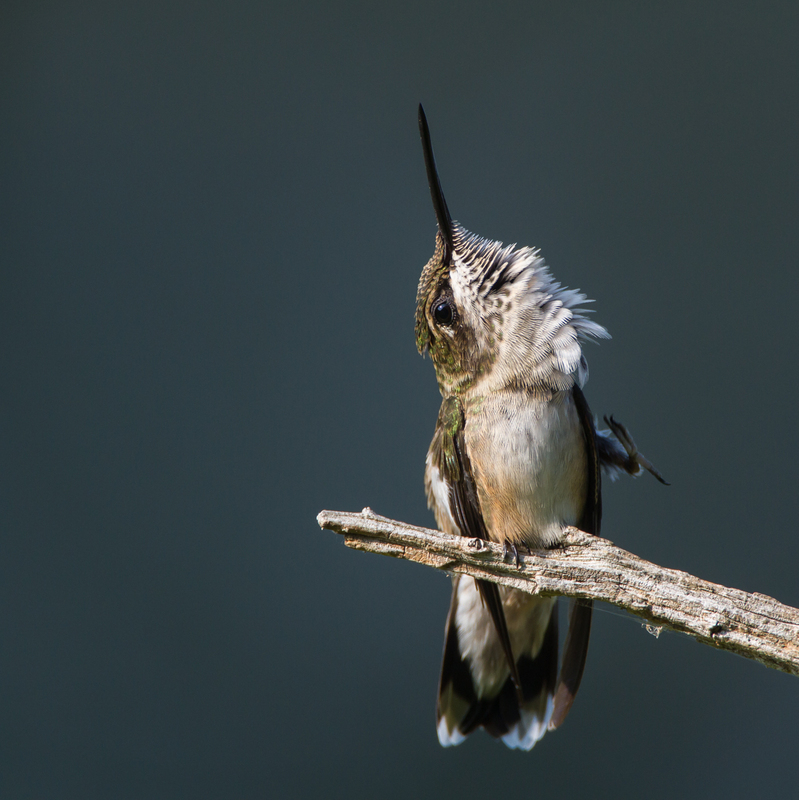 While the tail feathers of adult males are dark-tipped and pointed, those of young males resemble the female, being rounded and white-tipped. A better way to distinguish the sexes is to look at their throats. 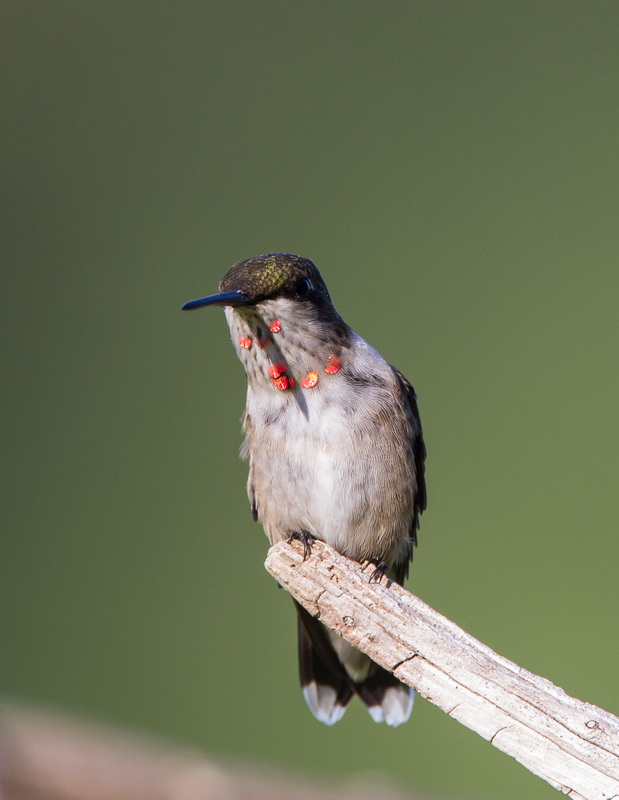 First-year males often have streaked throats (some females can as well), and frequently will have a few red feathers in their throat patch (or gorget) by this time of year. 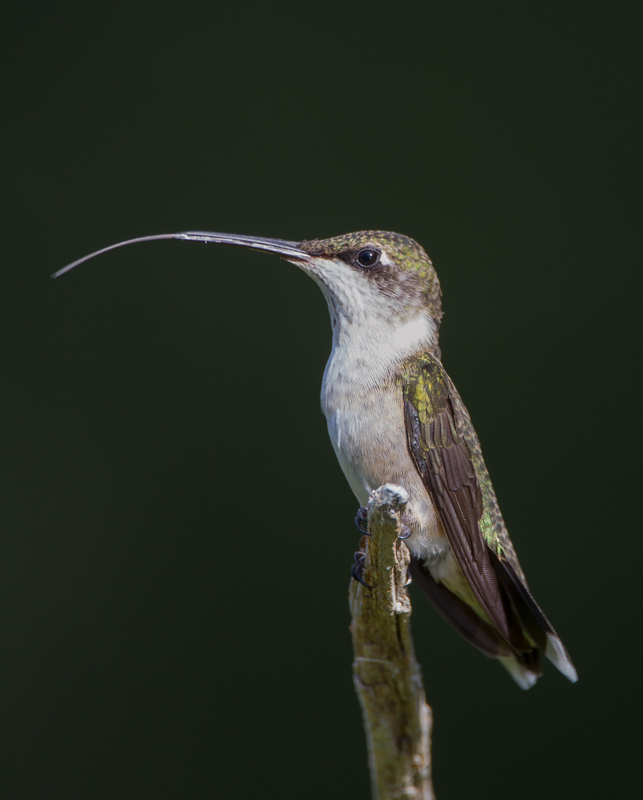 Adult male ruby-throats have about 200 specialized feathers on their throat patch, which is called the gorget. The outer third of these feathers are iridescent. They have microscopic grooves and air bubbles that scatter and refract incoming light to make the feathers appear red. But, the iridescent part of the gorget feathers are flat, and only reflect light in one direction. 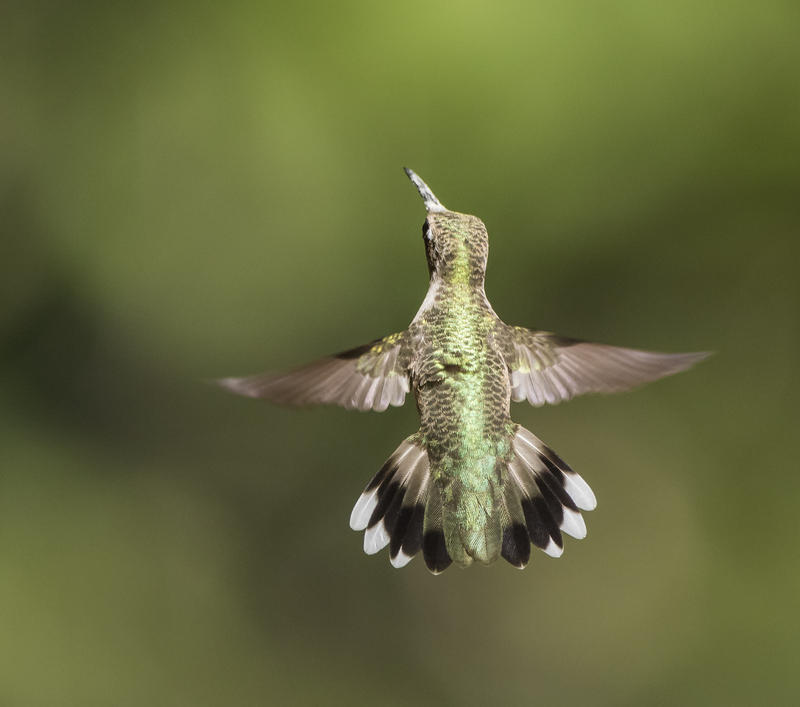 You have to be looking at the feathers from the right direction in order to see the flash of iridescent red. From other viewing angles, the feathers appear dark, or even black. 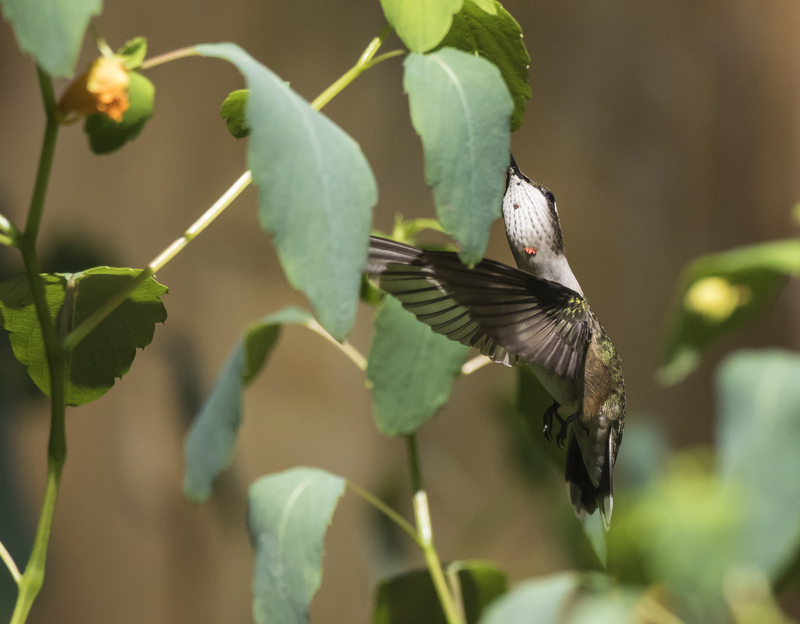 In looking at my images, I found several where the hummingbird was blinking. It almost looked like they had eyelashes. Well, in a way, they do. 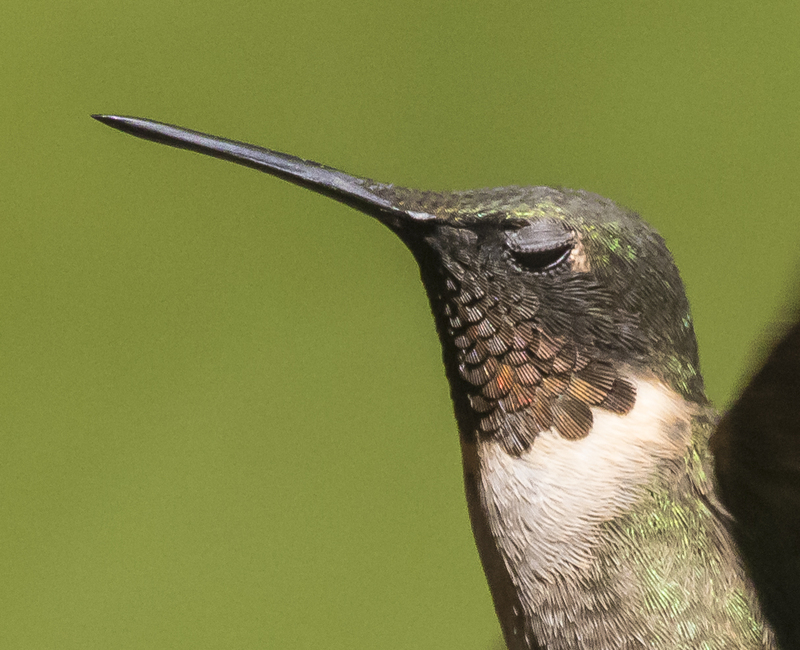 They have short bristle-like feathers along the edge of their eyelids. They probably function similar to our own by helping keep objects out of the bird’s eyes. 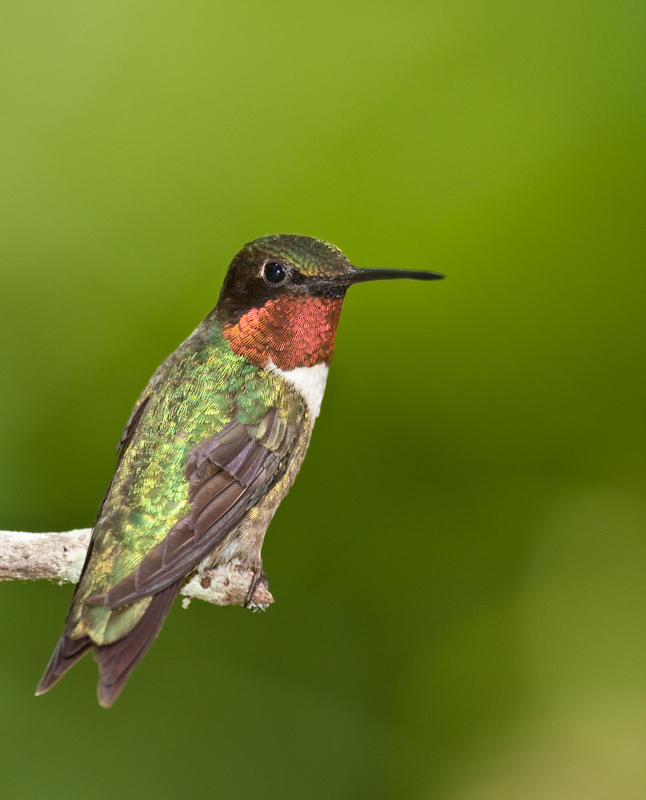 Ruby-throated hummingbirds are believed to ingest at least half their weight in sugars each day. If you watch them closely, you can see they also feed on small insects and spiders, often snatching tiny flying insects out of the air. 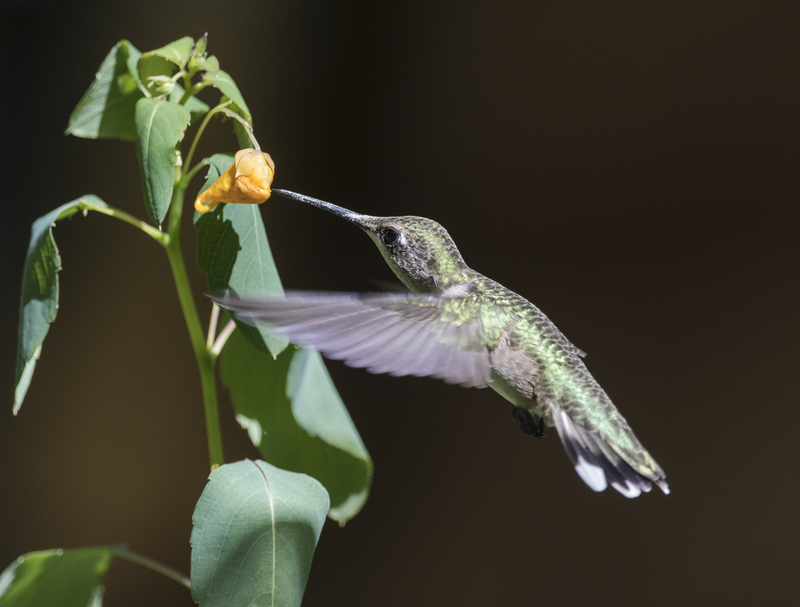 Dining on the wing as they do, hummingbirds have significant flight muscles, which account for about 25% of their body weight. Compare that to the analogous pectoral muscles of a human which make up a mere 5% of most humans. 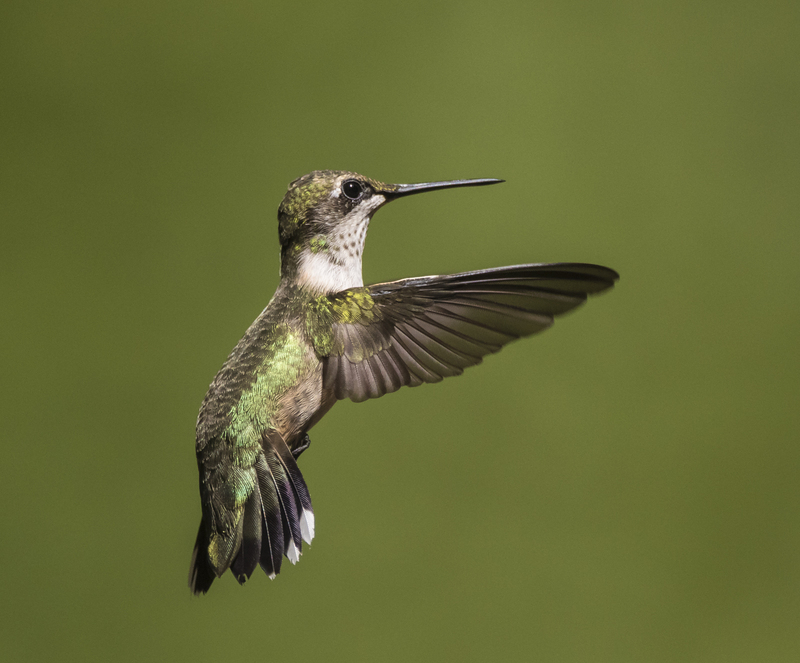 A hummingbird is fast-paced even at rest – their heart rate is about 1250 beats per minutes and they breathe about 250 times per minute while perched. And what about that tongue! 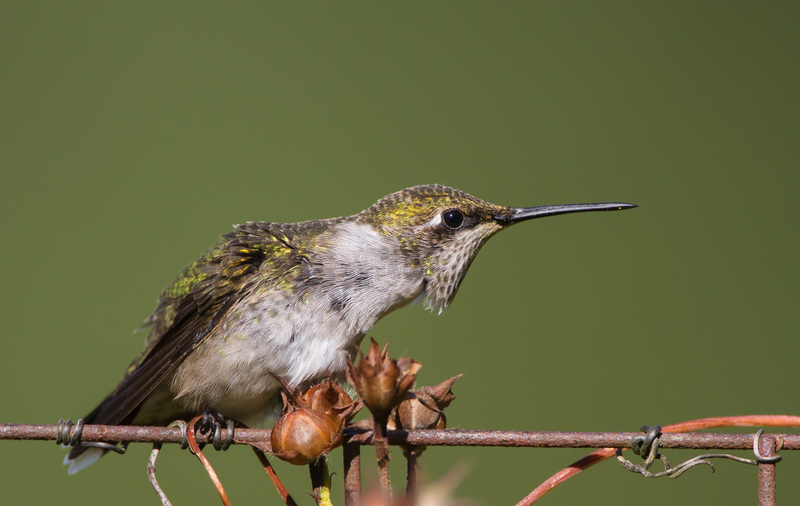 They can extend it a distance about equal to the length of their bill. 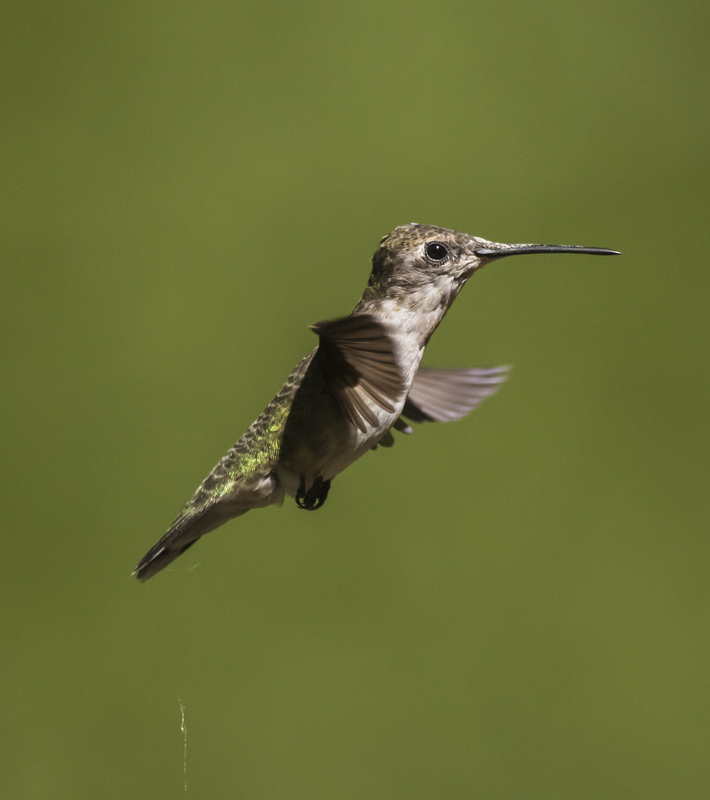 And when lapping up nectar or sugar water at your feeder, their tongue flicks in and out about 13 times per second. 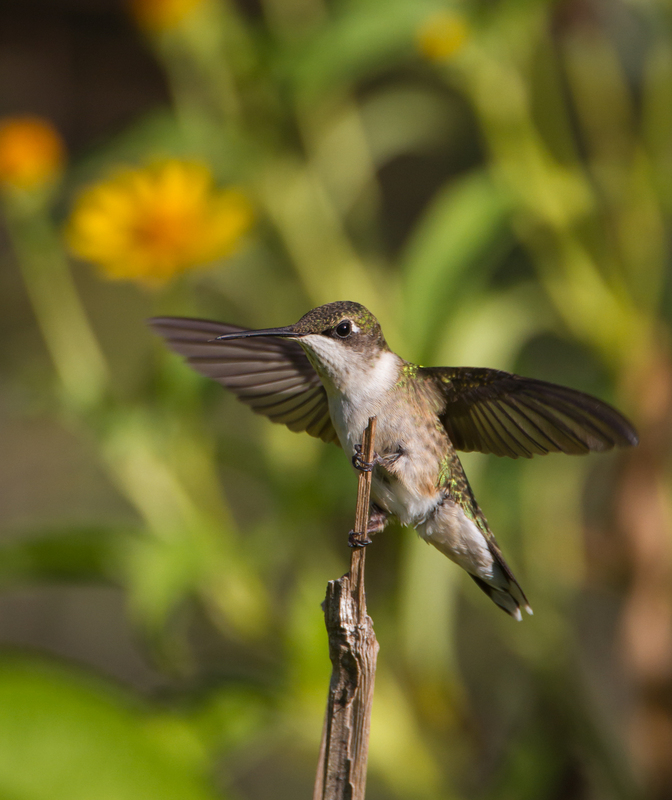 They are truly remarkable birds, the flying jewels of our gardens. 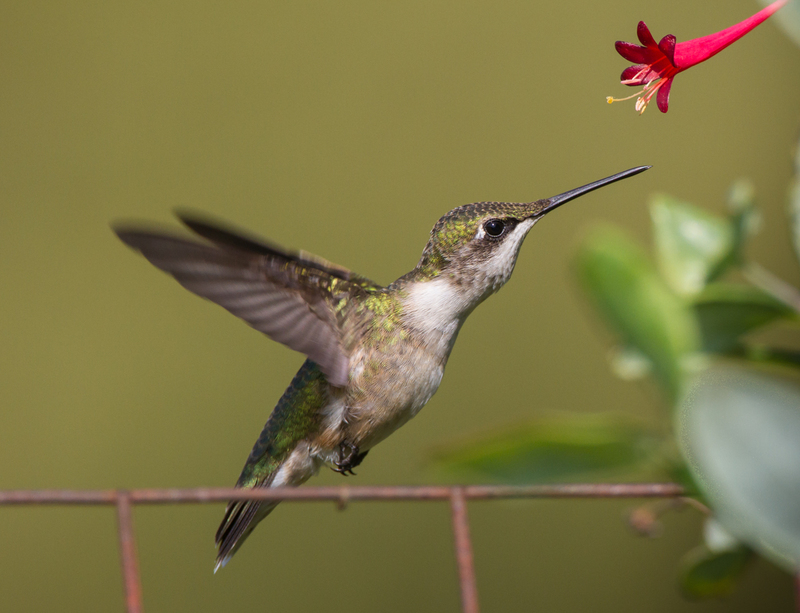 Enjoy them while they are still here, humming along at the flowers and feeders wherever you live. I saw my first one yesterday. I glanced out the window and a streak went by the flowers I had just bought for the window box. I went to the door and I saw it hovering, checking out the red taillight on my car, then it zipped away. 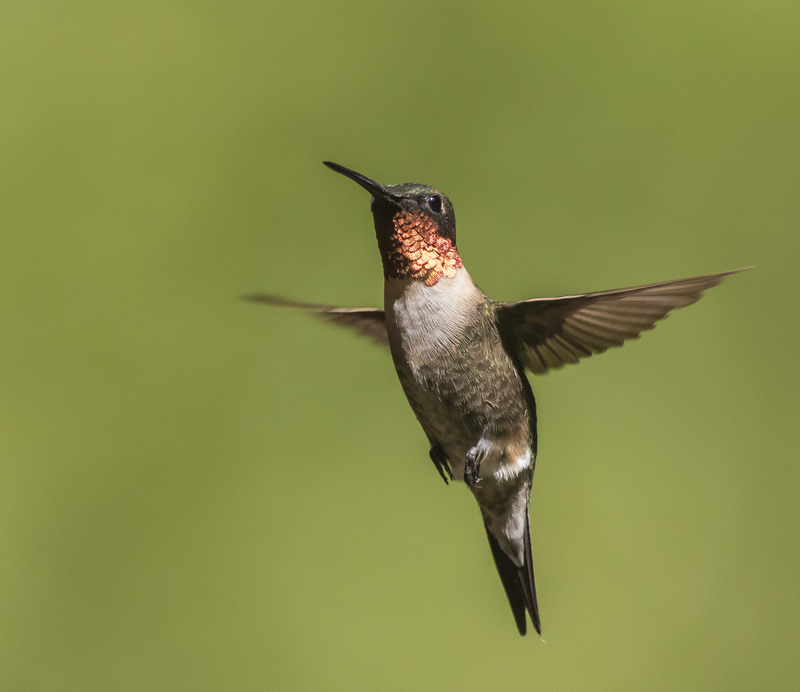 I went out to the garden and I heard the unmistakable hum of its wings as it checked out the feeder I had put up last week in anticipation of its return. The male’s are first to arrive, to find a territory, to feed and defend. It won’t be long now before a half dozen or more are buzzing over the garden, zipping by my head, squabbling with each other at the Coral Honeysuckle blooms. 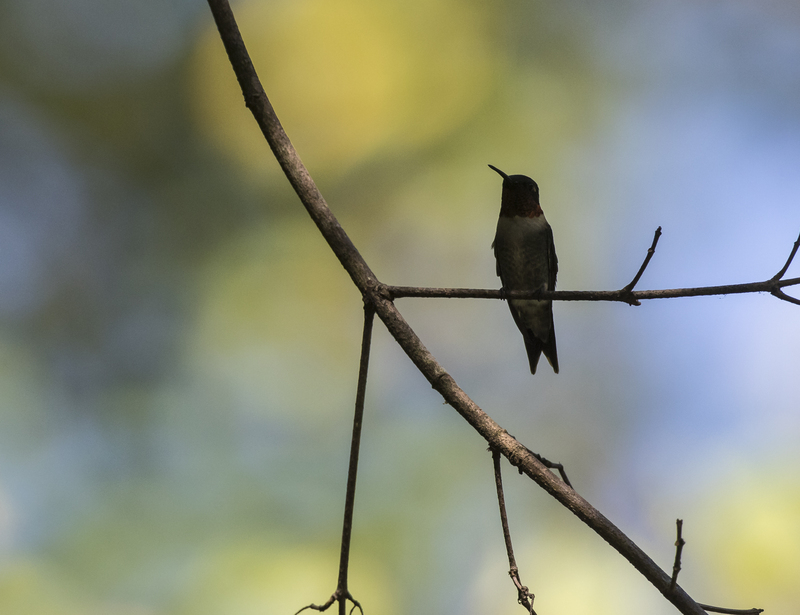 Even though there are still Juncos at the feeding stations, the signs are irrefutable – the Eastern Bluebirds are on eggs, the Redbud is blooming, and the first hummingbird is back….spring is here.